As much as ASUS fanboys have wanted to see their favorite company's answer to NETGEAR's first-to-market AC3200 class R8000 Nighthawk X6, Linksys beat ASUS to the punch with its EA9200 AC3200 Tri-Band Smart Wi-Fi Router. Like the R8000, the EA9200 is based on Broadcom's XStream "tri-band" architecture. I've explored XStream in MU-MIMO vs. XStream: The Coming Battle For Wi-Fi Airtime and in the R8000 review, so I won't be repetitive here. Suffice to say that AC3200's key feature is the ability to squeeze higher total throughput out of multiple 5 GHz devices. XStream doesn't bring range improvement to the party and for maximum link rate, it's the same as an AC1900 router, i.e. 600 Mbps in 2.4 GHz and 1300 Mbps in 5 GHz. 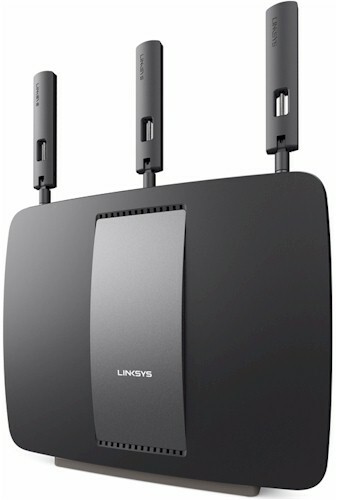 The EA9200 is Linksys' first stand-up router with a permanently attached base. The vertical posture assures that the three internal 5 GHz antennas will be positioned for best performance. There are lots of vent holes and slots on all surfaces except the front panel. There, only two small vent rows flank the central name plate above and below. Linksys brought back the backlit logo on the front panel dropped from the AC2350 class E9200. The callout graphic below shows the Gigabit WAN and LAN ports each have link and activity LEDs and even the USB 2.0 and 3.0 ports get itty bitty lights. The right side of the router sports Wi-Fi Protected Setup (WPS) and wireless on/off switches, the latter of which lights up red when wireless is disabled. Linksys didn't delay releasing the FCC internal pictures, so we can start with a shot of the board out of its case, but with RF cans intact. The three RP-SMA connectors at the top of the board connect to dual-band antennas borrowed from the EA6900. The second 5 GHz radio has to settle for three internal printed circuit antennas that you can faintly see arrayed along the right board edge. Popping the tops off all the RF cans show three Broadcom BCM43602 radios, one for 2.4 GHz, one dedicated to 5 GHz channels 36 - 48 and the other to channels 149 -161. Looks like each radio has external power amplifiers, although the photo isn't clear enough to ID the exact parts. The device in a little can under the center (2.4 GHz) radio is a PLX Technology PEX8603 3-lane, 3-port PCIe switch. According to WikiDevi, its also in the R8000 and provides fast PCIe connection for all three radios to the Broadcom BCM4709's single PCIe bus. Here's all the components in one nice table. NOTE: There are two 5 GHz radios. Signing up for a Smart Wi-Fi account is completely optional. You have access to all router admin features via a "local access" link in the login screen. You only need to register for a Smart Wi-Fi account if you want to access the router remotely using the Smart Wi-Fi iOS or Android apps or use some (all?) of the small set of third-party apps that Linksys has had since Smart Wi-Fi was introduced. The main dashboard shown below is the same as found on other Smart Wi-Fi routers. While checking out the Smart Connect feature (more later) I found the Network Map still has its quirks. It thought an iPad was connected via Ethernet for awhile and clicking the refresh icon didn't seem as reliable as clicking the Network Map icon when checking to see which 5 GHz radio devices were connected to. The WRT1900AC review contains an accurate summary of the EA9200's features and also its shortcomings. Once again the most glaring omission is outbound service blocking, something you get in even basic cheapie routers. Instead, the Parental Controls control scheduled per-device access to all internet services. In short, Linksys continues to lag behind ASUS, NETGEAR, TP-LINK and others in its (not so) Smart Wi-Fi routers. For wireless features, the biggest change comes from having to handle two 5 GHz radios. By default, the router comes up with the two in "band steering" mode. Note in this mode you can't control channel selection, channel width or "network mode", i.e. N only, G only, etc. Each 5 GHz radio is limited to a subset of channels. 5GHz-1 supports only channels 36, 40, 44 and 48 and 5GHz-2 supports only channels 149, 153, 157 and 161. This is due to the filtering and other design tweaks required to keep the two radios from overloading each other. Turning band steering off changes the screen, provides controls for each 5 GHz radio and enables channel selection, channel width and "network mode" (Mixed, 802.11n only, 802.11ac only for 5 GHz, Mixed, 802.11n only, 802.11g only for 2.4 GHz). Wireless features remain on the thin side compared to some other high-end routers. There is no transmit power adjust, no timed wireless radio scheduling and you can't set maximum link rates. There are also no beamforming or airtime fairness enables. Like the NETGEAR R8000, the EA9200 doesn't have wireless bridge or wireless repeating modes. On a more positive note, it looks like wireless guest networks are finally supported on both bands and you get a physical wireless on/off switch. You can also manually shut off each radio in the GUI and MAC filters can be set to allow or deny the devices in the list. But you'll need to check the Troubleshooting > Status page to get the MAC addresses of devices you want to control since there is no pick list presented. Both "Home" and "Enterprise" (RADIUS) wireless security are supported. On another positive note, it looks like Linksys has enabled more of the "Smart Connect" features that Broadcom built into its XStream technology. More on that when we test band steering performance,. Broadcom's XStream architecture is supposed to have superior storage sharing throughput. With wireless duties handed off to dedicated processors (and RAM) in each wireless radio, all the main BCM4709 processor has to do for wireless is shuttle Ethernet packets to and from the radios. This should leave it plenty of processing power for storage and internet sharing. Our standard Startech USB 3.0 eSATA to SATA Hard Drive Docking Station [SATDOCKU3SEF] with a WD Velociraptor WD3000HLFS 300 GB drive was used to test file copy performance. The drive was formatted with FAT32 and NTFS and both USB 2.0 and 3.0 performance tested. The results were disappointing. Table 2 summarizes USB 2.0 performance along with NETGEAR's R8000. Both products have essentially the same performance. The EA9200's USB 3.0 results are basically the same as USB 2.0, so something is wrong. I've flagged the problem to Linksys and will retest and update when I hear back. The R8000 had no problem with the same drive, as the results in Table 3 show. Routing throughput was measured using our standard router test process with the router loaded with 1.1.5.163672 firmware. Table 4 summarizes the results and once again includes the NETGEAR R8000 for comparison. Maximum simultaneous connections did not hit our test process limit. The IxChariot unidirectional composite plot for the EA9200 shows a cyclical variation between mid 700s Mbps and peak speeds near 950 Mbps for downlink. Uplink also peaked up to the same 950 Mbps region, but only with brief spikes. The EA9200 simultaneous up/downlink benchmark plot shows the usual battling at the beginning, due to IxChariot's Nagle's algorithm implementation. Once that settles down, the throughput battle continues with higher uplink vs. downlink throughput. Wireless performance has been retested. New results are here. The EA9200 is not Wi-Fi Certified. It was tested using the Revision 8 Wireless test process with 1.1.5.163672 firmware loaded. The router comes with WPS enabled on both bands. Win 7 and Win 8 client connections prompted to start WPS Pushbutton sessions, which quickly successfully completed. Both radios come up with unique SSIDs, auto channel and auto bandwidth modes and the two 5 GHz radios configured in band steering mode. For throughput testing, the router was first reset to factory defaults, then set to channel 6 and 20 MHz only bandwidth mode for 2.4 GHz. 5 GHz band steering was turned off and the 5 GHz - 1 radio disabled. The 5 GHz - 2 radio was set to 80 MHz channel width to enable 802.11ac link rates. Throughput tests were run on the 5 GHz -2 radio since it is the only one that supports our standard Channel 153 test channel. The NETGEAR R7000 bridge mode standard test client was connected using WPA2/AES encryption. Our standard practice is to center the router under test's antennas on the turntable, both front-to-back and side-to-side in the chamber. The chamber antennas are also centered on the turntable (front-to-back of chamber). This method is intended to keep maximum distance between the router under test and chamber antennas. Since the EA9200 normally has a backward tilt, it was propped up so the antennas were straight up and perpendicular to the turntable. The photo below shows the EA9200 in the test chamber. The Benchmark Summary below shows the average of all wireless throughput measurements made over the tested attenuation range. We'll put these results in perspective when we look at throughput vs. attenuation profiles next. We have only two AC3200 routers in the Router Charts database, the EA9200 and NETGEAR R8000. So the throughput vs. attenuation plots are easy to read. 2.4 GHz downlink performance is very similar. The Linksys has a slight advantage with strong signals and the NETGEAR with weaker levels. 2.4 GHz uplink plot is essentially the same for the two products. The 5 GHz downlink profile clearly shows the NETGEAR with superior performance throughout the entire signal range. Same goes for 5 GHz uplink. Linksys Smart Connect band steering is dynamic. Devices are constantly monitored and moved to the 5 GHz band that will yield the best performance for all devices. Devices with fast connection speeds are placed in the low 5 GHz band (5 GHz-1 radio). Devices with slow connection speeds are presumed to be legacy devices or located farther away from the router and are placed in the high 5 GHz band (5 GHz-2 radio) because it has slightly higher transmit power. If one of the 5 GHz bands experiences a high utilization rate, it will steer one of its devices to another band in order to prevent oversubscription. A "bounce detection" algorithm ensures a device is not steered too often within a certain timeframe to prevent frequently moving devices between 5 GHz bands. Devices are steered only when they are idle so their activity (i.e. gaming, streaming video) will not be interrupted by the steering process. Like the R8000, the EA9200 does not support 2.4 / 5 GHz band steering. Clients are only steered between the two 5 GHz radios. The EA9200 was located in the wireless testbed upper test chamber with the door open. The bridge mode R7000 was in the lower chamber with the door closed. This allowed me to use the testbed programmable attenuators to control the signal and therefore the link rate of the R7000. I set 20 dB of attenuation so that the R7000 throughput wouldn't dominate the other AC devices. All other devices were located within 6 feet of the EA9200, outside the test chamber and all received a nice, strong signal. I found the EA9200's band-steering was indeed dynamic. In my first set of tests, the 3x3 AC client insisted on connecting to the 5 GHz-2 radio along with the two N devices, despite a few power cycles. When I moved the two portable AC devices to another room to reduce their link rates, they nicely moved to the 5 GHz-2 radio. However, when I moved them back to their original locations, they stayed attached to the 5 GHz-2 radio. Note that all connections were idle when I moved devices around. When I went to write up this review, I found I had neglected to set the attenuation for the R7000 3x3 bridge client. When I set everything up for a retest, all clients connected to the 5 GHz-1 radio as shown in the Network Map below. The R7000 bridge is shown in the map as a generic Network Device and the computer wired to it running the IxChariot endpoint shown as WLANTEST-STA. So I ran an IxChariot test and got 86 Mbps total downlink throughput. The plot's similar colors make it difficult to tell, but using the legend we see that the highest throughput is achieved by the 1x1 N 5th iPod. Running an uplink test yielded higher total throughput (107 Mbps) with the most going to the 1x1 AC MotoX this time. After a power cycle, clients came up attached as they "should" be, i.e. the "slow" N devices on 5 GHz-2 and "fast" AC devices on 5 GHz-1. Here's the Network Map to prove it. The downlink test in this configuration yielded 237 Mbps total throughput with the 3x3 AC device getting the lion's share. This is a 2.8X improvement (86 to 237 Mbps). Uplink throughput improvement was more modest, only 1.6X (110 to 169 Mbps). Note to Linksys: A tablular presentation of device connections like NETGEAR has in the R8000 (shown below) would have made it a hell of a lot easier to track device comings and goings while testing Smart Connect. The Network Map is pretty, but the font size is waaay too tiny on the wireless device icons. I've said it before: $300 is a lot to spend on a router. And judging from comments in the Forums, people are starting to push back. For that money, people expect to see huge performance increases and, frankly, AC3200 products don't deliver. Yes, they do provide higher total throughput if you have more than a couple of 5 GHz devices in constant simultaneous use. So you should see fewer problems if you have a lot of video streams going, but only if devices are using 5 GHz. I give Linksys credit for enabling the dynamic band-steering capabilities of Broadcom's XStream technology. But even in my limited experiments, I found "Smart Connect" wasn't very. Even with strong signal levels, devices with very dissimilar link rates ended up on the same radio. Smart Connect is going to have to get a lot more intelligent for people to cough up the extra dough. Between the R8000 and EA9200, I'm giving the nod to NETGEAR. Yes, the R8000's Smart Connect implementation uses static device assignments that aren't changed until the router is power cycled or devices disconnect and reconnect, but it provides similar total throughput gains. It also has better 5 GHz performance, range in particular, a much better feature set including OpenVPN and full outbound port filtering to better control internet service access. And street price is already headed down, making it currently $25 cheaper than the EA9200. The most compelling reason, at least for router geeks, is that DD-WRT is available for the R8000, albeit in early form. At least Linksys hasn't advertised OpenWRT support for the EA9200; they messed that up enough with the WRT1900AC.